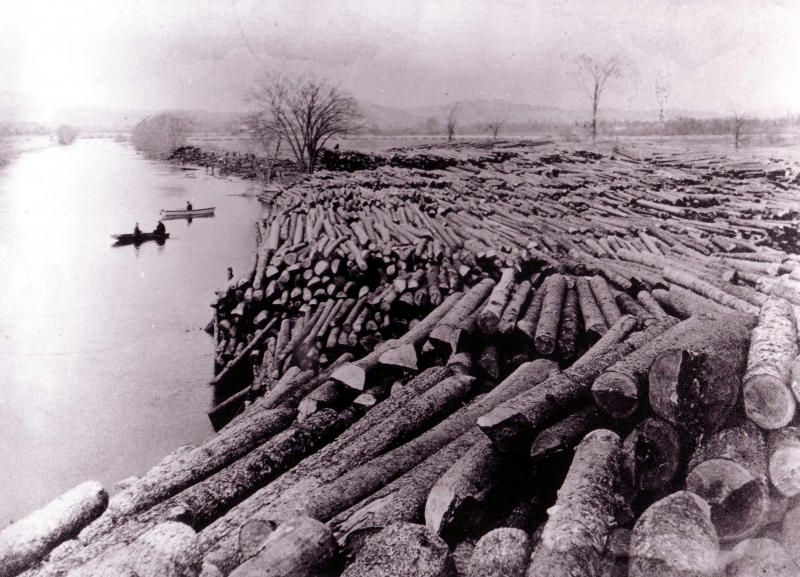 Image shows logs stacked by the side of a river. There are two rowing boats in the river. One, a flat bottom skiff, has two people in it. The other has one person. 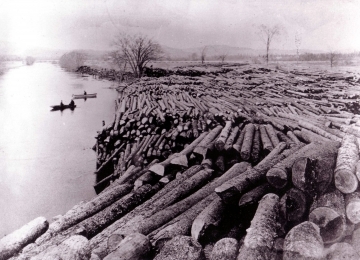 The entire right side of the image is piles of cut logs stacked many layers high on the bank of the river. In the distance is a broad river floodplain and some low hills. This is one of the transfer points, where logs that had been floated down river are hauled ashore and loaded onto railroad cars or sawed directly. This is fall as the few deciduous trees in this image have no leaves. John Shane (UVM, 12/04) indicates that these might be spruce and white pine logs and is not aware of anyone rafting any hardwood logs in New England-- at least not in those volumes. And the fir would have been unattractive for saw timber-- not really valuable except as pulp and I am betting what we see in the picture is destined for sawing. Loona Brogan writes on 2006-12-11: The logs closest to the camera are probably spruce: as Professor. Shane said, fir isn't much of a saw log (used for pulp). If you enlarge the image, you'll see darker, plated-looking bark on logs further from the camera. These are white pine.